Do you know how your understanding of preaching has been shaped in recent centuries by the Pietists, the Revivalists, the Liberals, the Pragmatists and the Consumerists? If you don’t, you need to because these influences are shaping the crisis of preaching in the church today. That’s why this message by Al Mohler deserves a wide, wide hearing. It is 21st Christian preaching and its origins 101. The frightening reality today is that preaching has metamorphosized into many different forms, and we are therefore required to differentiate these unbiblical forms from true biblical preaching, and to do that we label biblical preaching as “expository” preaching. And sadly, expository preaching is far from the norm in the church today, and it’s no wonder given the contented widespread biblical ignorance we see in the Christian church. Mohler is a champion for expository preaching, and in this message he carefully and wisely considers the many arguments given by opponents of expository preaching, and examines how each of these historically developed from bad, and even shocking theology. Hence his provocative title. This should be required listening for your leaders and discipleship groups, if not your whole church. By the way, if you haven’t listened to any of the messages at the 9 Marks at SBTS conference you are missing a real treat. Michael Reeves has been doing a tremendous job of providing very interesting and helpful talks on various aspects of church history, and highlighting key figures. So who is Schleiermacher and why should we care? He is the father of modern liberalism. And Reeves 3 session talk should interest you because, even though you may not think you are a theological liberal, chances are you are going to see how this man you’ve never heard of has probably influenced parts of your theology, and definitely much of what we in our conservative churches. The modern church practically denies Scripture by embracing the sociological, the psychological and the anthropological as having authority over God’s Word. The modern church does not know God. The modern church has exchanged the Gospel and the power of God for tricks, techniques, and pagan-like methodologies.The modern church has robbed people of the power of the Gospel by embracing the heresy of decisionism. The modern church is focused on prosperity and not on sin, thus defusing the one thing necessary for the Holy Spirit to deal with to restore a sinners true relationship with God. The modern church is filled with and caters to the goats while the sheep starve under the hand of capitulating leaders. The modern church has remained silent on the reality that God`s people are called out to be separate. The modern church has torn Matthew 18 from Scripture, and along with it loving, compassionate church discipline. Paul asks the loaded question of leaders, “Are you smarter than God? Then stop acting like it!” There is a sharp bite to Washer’s indictment, yet the cutting comes from spiritual wisdom, and one who loves Christ’s bride, the Church. Washer spent 10 years ministering in Peru, where he started a missions organization called HeartCry Missionary Society, and has since returned to the US to oversee this organization. He makes Grace Life Church of the Shoals his church home. Many thanks to Chad of Christ Fellowship in Hannibal, Missouri for connecting me with Paul Washer. You will be hearing much more about this man as my iPod is filled with Paul Washer mp3’s. Should Evangelicals abandon the label ‘Evangelical’? Does it carry any real meaning anymore? How did the ‘Evangelical’ movement begin, and why? Who were the key players who fueled this movement? How did Evangelicalism become so fragmented into the condition that we see today? 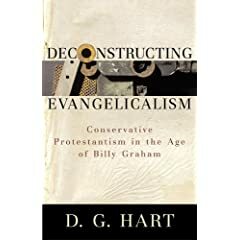 These are just some of the questions that Daryl and the lads at CTC ask as they discuss Hart’s book Deconstructing Evangelicalism. This is a fascinating interview. Daryl Hart is also the author of the biography of J. Greshem Machen, Defending the Faith. Author Steve Nichols discusses some of the themes and observations found in his book Jesus: Made in America. Nichols and the team at Christ the Center discuss the distinctions between the common cultural perception of Jesus as opposed to the Biblical Jesus. Our impressions of Jesus are largely based on a Victorian misrepresentation that our society has built a false image on. One chapter he has titled ‘Jesus and Vinyl’ where he demonstrates that Christian’s draw most of their understanding of Jesus from phrases and choruses from Christian music that taken together provides a very distorted picture of who Christ is, and in reality is theology in a vacuum. The bottom line of Nichols argument is that our society has made Jesus in our image which is far from the Biblical context. This is a very enjoyable discussion about a subject that impacts every Christian today. 9 Mark’s Mark Dever interviews R.C. Sproul about how his theology developed amidst German liberalism and how he penned his many great books.